In February, Toshiba will start shipping its first SDHC memory card with embedded wireless LAN functionality. The new card, FlashAir, has an 8GB capacity and allows users to upload and download photographs to and from a server and to exchange photographs and other data with other devices, including digital cameras that are FlashAir compliant and, smartphones and PCs that support wireless LAN. Even in digital cameras not compliant with FlashAir (this basically applies to all current models), the new card can share digital images with smartphones and Wi-Fi enabled computers. 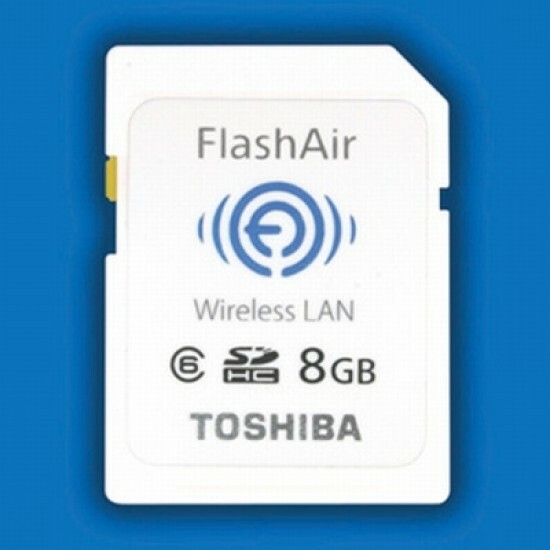 Toshiba will secure certification of FlashAir for wireless communication in Japan, North America and Europe. Pricing to be announced. TOKYO – Toshiba Corporation (TOKYO: 6502) today announced that it will launch the world’s first SDHC memory card with embedded wireless LAN functionality to meet the SD Memory Card Standard. The new card, “FlashAir™”, has an 8GB capacity and supports both peer-to-peer transfers and uploads to and downloads from servers. Samples will be available from November 2011 and sales will start in February 2012. At a time when digital cameras have achieved immense popularity, users want a quick and easy way to share photographs with friends and to transfer them to and from online storage services and social networks. Toshiba provides the solution with FlashAir, the world’s first SDHC memory card with embedded wireless LAN functionality that is fully compliant with the SD Memory Card Standard. FlashAir’s embedded wireless communication function allows users to upload and download photographs to and from a server and to exchange photographs and other data with other devices, including digital cameras that are FlashAir compliant and, smartphones and PCs that support wireless LAN. All transfers are done wirelessly, without any need for a cable connection. Key features of the new card include the ability to receive as well as transmit and lower power consumption than other cards with similar functions.